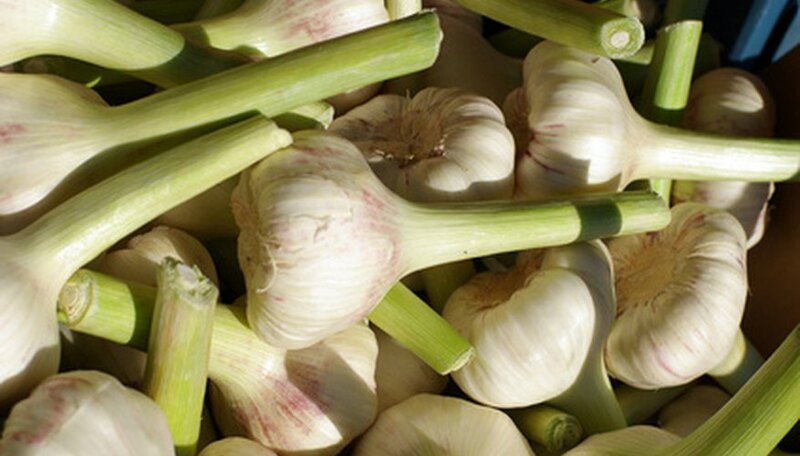 Garlic is one of the tastiest members of the culinary garden and one of the easiest to grow. A small plot of land and a few heads of last year's garlic are all that's needed to get started. Whether you live in the warm, mild areas of the Olympic Peninsula and Puget Sound or in the harsher areas of Eastern Washington, late fall is the time to plant. Get your garlic in the ground before the first freeze and you will be putting fresh garlic on the table come summer. Turn over the soil in the garden plot using a sturdy garden fork. Mix in five to eight shovels of rich, well-rotted compost to improve nutrient levels in the bed. Dig holes that are 3 inches deep and 8 inches apart. Space rows 1 foot apart. Plant garlic closer, if desired, but it will create more, smaller heads at harvest. Break off the garlic from the head. Place one clove of garlic in each hole so that the imprint part is down and the pointed top is up. Fill in the soil over each clove of garlic, making sure to eliminate air holes, which cause oxidation that leads to rot. Water the area until the soil is damp to a depth of at least 4 inches. Spread a 4-inch layer of mulch such as chopped leaves or alfalfa on the garlic bed. Water once a week though dry weather to keep the soil moist to a depth of 4 inches. Discontinue watering in mid- to late June. Too much water will encourage green growth but neglect bulb development as harvest time nears. Where each clove breaks away from the head is a hard, imprinted place where it attaches to the base of the head. Make sure this imprint is not damaged. Damaged cloves are more likely to rot than sprout. Garlic plants put out long scapes that curl twice and the produce a flower in the spring. These are delicious. Snap them off the plant and add them to salads, stir fries and summer soups. When the lower leaves begin to turn brown in August, the crop is ready to harvest. Dig up a head or two to check its development. Big and plump heads mean it's harvest time.